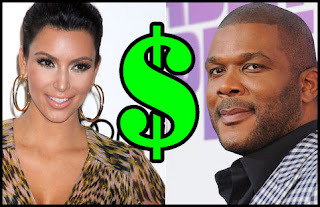 AverageBro: Should Kim Kardashian Be Starring In A Tyler Perry Movie?!? Should Kim Kardashian Be Starring In A Tyler Perry Movie?!? Given Tyler Perry's status as Hollywood's current biggest earner, far be it from me to question the man's business acumen. He makes millions peddling C-grade movies to lonely single black women churchgoers. I typically end up paying to watch said movies. So yeah, joke's definitely on me. If there's one thing I can give Perry, it's that he usually does a decent job of mixing well known (ie: Angela Bassett) actors with under the radar (ie: Tasha Smith) talent. In an odd way, he does actually give quite a few black folks who might otherwise be working a Sizzler their shot at the big screen. These people are generally decent/competent actors, although you could probably look at the coontastic cast of "Meet The Browns" and disagree. I prolly wouldn't argue with you on that one. That said, the "controversy" brewing around the casting decision for his latest movie sorta rubs me the wrong way. Kim Kardashian has arrived in Atlanta to film scenes for Tyler Perry’s upcoming movie, “The Marriage Counselor.” Some of Perry’s fans want the reality show personality off the project. A number of comments from Perry’s website demonstrate some folks’ desire to see Kardashian, who just filed for divorced 72 days after her made-for-TV wedding, gone. “Kim Kardashian in your movie? Why have you stooped this low?” one person posted. Okay, black women folks, I'm gonna call bullsh*t on this one. Look, I get it. Kim K's already not exactly a fan favorite to lots of sistas because she "dates" a lot of high profile black men. So there's that. I'm thinking quite a bit of the criticism is reflective of such sentiment, whether sistas are willing to admit it or not. But seriously, this isn't The Color Purple. This is another lousy Tyler Perry movie that's gonna be on TBS before the NBA Finals are over (as if!). Kardashian isn't the first non-talented person to get a starring movie role, and won't be the last. Perry knows his formula, and putting Kim K on those movie posters is probably going to bring in an entirely new audience to witness the coonery. This is all about a brotha trying to get ahead. Don't hate. If you don't like it, for the love of baby Jesus, please do not pay to see this movie. Go read a book, or learn Excel formulas, or something more productive with your time. "Don't Negroes Have More Important Sh*t To Be Worrying About?!?" Question: Should Kim K be starring in a Tyler Perry Joint? Don't Negroes Have More Important Sh*t To Be Worrying About?! ?